Bruce Jenner, the former Olympian who has become a reality TV star, revealed he is transgender Friday in a highly anticipated interview with Diane Sawyer. "Yes, for all intents and purposes I am a woman," Jenner said on ABC's "20/20." "People look at me differently. They see you as this 'macho male,' but my heart and soul and everything I do in life, it's part of me. That female side is part of me. It's part of who I am." Kardashian family members showed their support for Jenner. At an event in New York City Friday, Kim Kardashian explained: 'We always support each other. Our family is super-supportive of everything that we do and you know we're gonna watch the special tonight and support Bruce and watch it with him tonight." Much of Sawyer's interview focused on family and tolerance. "This is a family love story," she told colleague George Stephanopoulos before the interview was shown. 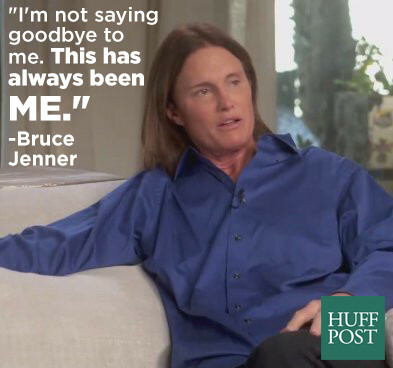 Early in the interview, Jenner said that he and his family would "change the world." "Today, millions of people learned that someone they know is transgender," GLAAD president and CEO Sarah Kate Ellis told HuffPost Gay Voices. But even with the best of intentions, many people are products of a less inclusive history and can struggle to properly express support. A lack of sensitivity and misconceptions about gender identity can lead to a perpetuation of stigma and feelings of hopelessness, according to Christine Milrod, a transgender affirmative therapist and member of the World Professional Association for Transgender Health. Here are a few things to keep in mind as you offer your support to a loved one who may be transitioning. Phrases like, "I'm with you no matter what," and "I support you," go a long way when a person is transitioning, Milrod advised. You may not always understand, but acknowledging those failures can actually help with the process. "The most important thing is not to be perfect, but [instead] loving," she said. Rebecca Juro, a radio host who is transgender, said the best way to be encouraging is to take cues from your loved one who is transitioning. "They will tell you what they need," she told HuffPost. "Be a support system ... be the safe place that they can come back to. Treat them as any other person of that gender who is your friend." Realize that this isn't a choice. The gender someone identifies with is hardwired into their biology, Milrod said. It's important to understand that when offering your support. "Transitioning isn't just bravery, it's a necessity," she explained. "They're born this way. Not transitioning isn't an option." Know that you will go through a range of emotions. Many people experience feelings from denial to anger, Milrod said. While these emotions are normal, it's how you react that counts. "Even if you're angry, try to inform yourself as much as possible," she said. "If your loved one came to you and said, 'I have diabetes,' you're not going to be angry. You're going to be nothing but concerned and helpful. But because people have such a great investment in terms of their own feelings and the internal representation they have of their loved ones, it's very hard to let that go." You may make mistakes during this time, such as a poor reaction or unsupportive comments, but the worst one would be to cut off contact, Milrod continued. "It's going to hurt the person's feelings," she said. "People who transition are fearful emotionally -- and what they fear the most is loss of love." Educate yourself on transgender issues. The best way to be supportive is to arm yourself with knowledge on stigma and the basics of gender expression. The American Psychological Association offers thorough explanations on gender identity. GLAAD is another excellent resource for transgender individuals and their loved ones. It's also important to realize that gender does not equate to sexuality, Juro said. "Gender identity is who you are, not what you are," she explained. "I would like for people to understand that somebody's physicality, their genitalia and the state of their body, is not the same thing as either how they feel themselves to be -- man or woman or something else -- or their sexuality, whether it's homosexual or straight. They're unrelated to each other, so it's important not to conflate those things." Address your loved one based on their identity. Using proper names and pronouns that align with the person's gender and identity are crucial, according to the American Psychological Association. If you're ever unsure, it's also okay to ask for their name. "You're not going to be perfect, you're going to slip," Milrod explained. "If you forget, immediately correct yourself. I think the most important thing you can say to a [transitioning] loved one is that you'll try your best." Remember that each person's experience is different. There has been a strong news narrative around gender identity lately, but that doesn't encompass every transitioning person's journey. The experience is not one-size-fits-all, Milrod said, but going to therapy with your loved one can help you both understand the process. "You can address misconceptions, receive support and get other resources," she explained. "If your [transgender] loved one invites you to come to therapy, don't say no. Show up." Above all, your loved one's core character is still the same -- and that's vital to keep in mind. "The underlying foundation of being supportive is love," Milrod said. "You have to discard and replace that internalized image of what's on the outside, but not what's on the inside. Love is still there. The love you have for your family member or friend -- that's your anchor."